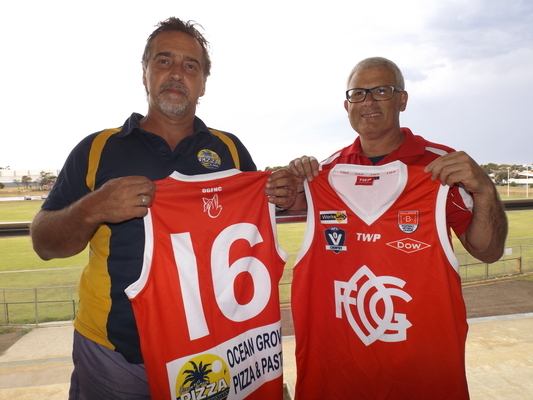 New playing strip: Grubber senior player Kelly Williams, Grubber president Tony Potter, Ocean Grove Pizza and Pasta's Joe Liistro and Ocean Grove senior coach Wayne Walsh unveil the club's new jumper for 2016. 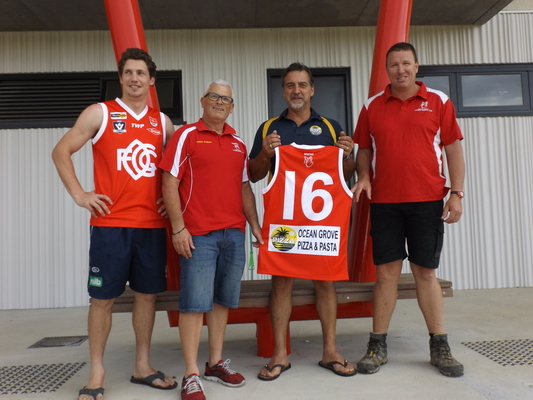 OCEAN Grove Football Club unveiled its 2016 playing strip last week at their new headquarters at Shell Road. This year’s guernsey has been brought back to life and was last used in 1999 during the Grubbers equalmost dominant era, where the club won four flags in a row from 1994 to 1997 under Brendan McCartney. “We are rapt to go back to a very successful jumper that we have played in in the past and one that the members voted on unanimously, and it was really good to unveil that,” Ocean Grove Football Netball Club president Tony Potter said.